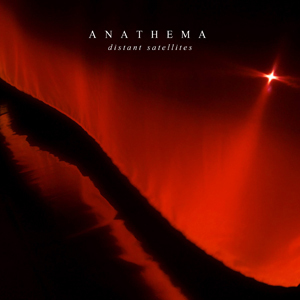 Anathema's latest album, Distant Satellites (2014) is a darker and more minimalistic and electronic effort than its two precedessors, but not a radical stylistic departure. In fact, the album starts with two songs that are tied together musically and lyrically, just like Weather Systems (2012). While "The Lost Song" may not be as mind-blowing as "Untouchable", it's a damn good way to open the album. Part 1 has got a great rhythmic hook, while Part 2 plucks at your heartstrings with its beauty. "Dusk (Dark Is Descending) is not a stand-out track, but also not as forgettable as the weak points of the last album; the opening guitar arpeggio is pretty cool. "Ariel" is similar to "The Lost Song, Part 2" in the sense that it's a piano ballad sung (for the most part) by Lee Douglas and shines with its melodies. "The Lost Song, Part 3" feels a little redundant: it has the same rhythm as the first part, but isn't nearly as catchy or emotionally powerful, which makes it a weird choice for first single. "Anathema", on the other hand, is a majestic piece of music that deserves to bear the name of the band. Vincent Cavanagh's high note at the end followed by his brother Danny's solo is one of the best moments in the band's discography, and that's a huge achievement for a band with such a long history. "You're Not Alone" kicks off the second, more electronic half of Distant Satellites. The repetitive vocals irritated me initially, and it's hard not to think of this under 3 minutes long tune as a filler track, but I like the way the electronics have been combined with the rocking guitar riff. "Firelight" is an ambient track that doesn't work on its own, but it's a perfect introduction to the title-track. "Distant Satellites" is an absolute winner and soothing yet energetic - in a perfect world this song would be played in clubs all around the world! "Take Shelter" feels slightly underwhelming after the greatness of the previous song, but it's got beautiful strings and a nice atmosphere, making it a decent closer. For me, Distant Satellites is a step up from Weather Systems: it's more dynamic and I dig the less heavily layered instrumentation and the darker vibe. It doesn't reach the brilliance of Anathema's best works, but the highlights are easily among the band's greatest songs, and the experimentation gives the record a shade of freshness, though there's plenty of familiarity in the first half. The album doesn't sound rushed, although it was done with a tight schedule. It'll be interesting to see whether Anathema will further explore the electronic path or if they have something different in store for us listeners! 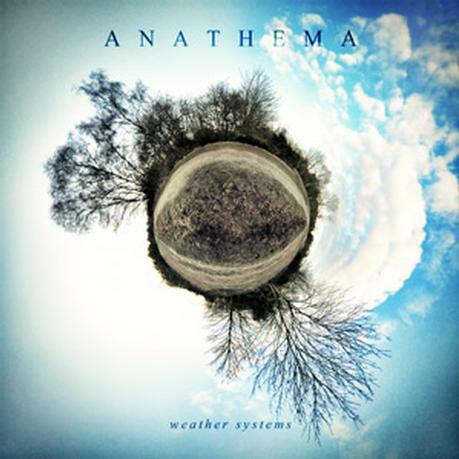 Deep in my soul in a place that's surrounded by aeons of silence"
The ninth studio album by Anathema is the densely layered Weather Systems (2012). Fingerpicked guitar melodies, vocal harmonies, and orchestrations are all over the album, and its uplifting atmosphere picks up where We're Here Because We're Here (2010) left off. The two-part suite "Untouchable" opens the album and is one of the greatest things ever written by Anathema. The first part is a rock song, while the second is a more subdued piano ballad. These two tracks have got hummable melodies and rich arrangements that make them irresistible. The rest of Weather Systems can't match the impact of the opening duology, but there's still plenty of good stuff. "The Gathering of the Clouds" isn't a great standalone track, but it's a good introduction to "Lightning Song", which is driven by Lee Douglas' fantastic vocals and has a powerful ending that always makes me feel pumped. "The Beginning and the End" is yet another piece of evidence that Vincent Cavanagh is one of the most passionate singers in the business, and I love Danny Cavanagh's solo and the beautiful piano. "Internal Landscapes" is a slightly repetitive song, but it's a perfect closing track, and the spoken word sections about a near-death experience are touching. The post-rock influenced "Sunlight", like earlier songs featuring Danny Cavanagh on lead vocals, isn't a special song (I think there's a reason this one hasn't been played live) and feels like a filler track. "The Storm Before the Calm" is a 9½-minute epic that feels like two songs glued together, as the industrial-sounding first half is far-removed from the big orchestral ending. However, I guess it makes sense because of the theme of the song (the first half is the "storm", while the second is the "calm"), and I have to admit that the tune came across better when I heard it live. "The Lost Child", on the other hand, just plods along and doesn't stick out from the rest. Weather Systems was a disappointment for me at the time it was released, because the best songs ("Untouchable Pt. 1" and "The Beginning and the End") had been released in advance of the album and made my expectations too high. After revisiting the album, I still think Weather Systems is slightly uneven and lacks variety. The highs are fantastic, but don't save it from being in the lower half of my Anathema album ranking. That said, I'm glad the record brought Anathema more exposure, because they've earned their success. After coming back with a bang on We're Here Because We're Here (2010), Anathema made a follow-up to Hindsight (2008) by reimagining its early material with orchestral arrangements and piano. There's also drums, E-bow, acoustic guitars, and some vocals, but the record is largely instrumental. Falling Deeper isn't simply a bunch of doom metal songs played without growls and distorted guitars: the band took some of the themes from the original songs and built new compositions out of them. "Crestfallen" is the most successful remake, taking the intro (read: the best part) and turning the slightly tedious 10-minute doomster.into a beautiful 3-minute piece. "Kingdom" is another bullseye, featuring sung lyrics instead of the original spoken word approach. "Sunset of Age" has changed the least, keeping the original song structure and featuring gorgeous harmonies by Vincent and Lee and a powerful guitar solo by Danny at the end. "We, the Gods", however, is a disappointment, as the epic Iron Maidenish outro isn't included in this version. The (songs that used to be) acoustic ballads are weak spots as well: "Alone" is almost twice as long as originally, and drags on way too much, while "J'ai Fait une Promesse" lacks emotional power without vocals. "Everwake" is pretty much identical to the original, only with orchestrations complementing the acoustic guitars. Luckily Anneke van Giersbergen's graceful vocals help the remake be at least as good as the old one. I was mildly disappointed by Falling Deeper initially, but I've learned to appreciate it as is, though I still think there's room for improvement. The short length of the release is totally understandable, because hiring a string orchestra isn't exactly cheap, but at least one of the ballads could've been replaced with another rearranged doom metal song, such as "Under a Veil (of Black Lace)" or "Shroud of Frost". However, if you throw out all your expectations and notions of what the album should've been like, and just give it a spin without thinking too much, it's an enjoyable and relaxing listen. It's got beautiful arrangements on it and demonstrates that despite all the stylistic changes, the essence of Anathema's music has never changed. 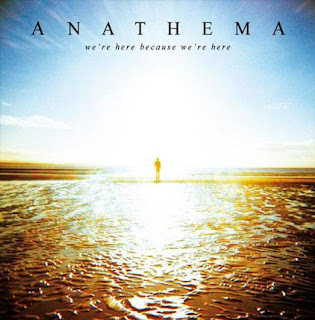 I have soared through the sky seen life far below in mind"
Anathema finally released its 8th full-length album in 2010. We're Here Because We're Here is the start of a new phase: the sound is characterized by orchestral arrangements, a heavy dose of piano, Lee Douglas' greater vocal presence, Danny's E-bow leads, occasional rhythmic experimentation, as well as post-rockish song structures that start out soft and build up to a climax. 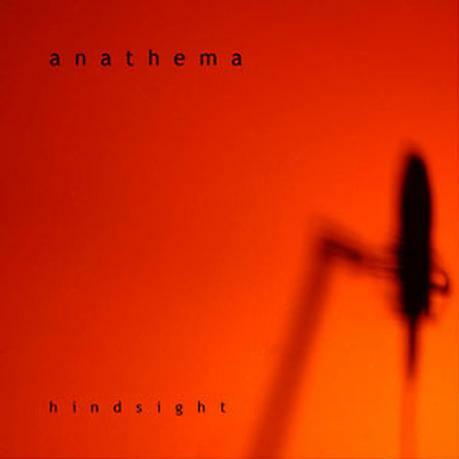 The album has a more optimistic tone than any of Anathema's previous releases, which stems from the positive changes in the band members' lives, especially Danny Cavanagh's. "Thin Air" is a great, upbeat opener that sets the tone for Anathema's modern style. "I love you" may be an overused phrase in popular music, but in this song it sounds perfectly honest. The lyrics can also be interpreted as the band's statement on its rebirth: "We've come too far to turn back / This is where we stand and face it / This is who we are." "Summernight Horizon" is a louder and more intense song, but has an uplifting chorus, which separates it from the heavier tracks on previous albums. The mix of emotions that Anathema has mastered over the years continues in "Dreaming Light", which manages to sound wistful yet optimistic at the same time. Some people may find this tune too cheesy, but in my opinion it never crosses that line. "Everything" is a song about finding peace of mind and coming to terms with yourself - not one of the highlights of the album, but I love the pulsating 9/8 beat. "Angels Walk Among Us" - which features Ville Valo (HIM) on backing vocals - is honestly one of the most beautiful songs I've ever heard: Danny's wailing Ebow, Vincent and Lee's emotional vocals and the powerful climax are simply delightful. After the mostly spoken track "Presence", we get to the high point, which is "A Simple Mistake". This song has such an incredible build-up that few Anathema songs have managed to match it, before or after this album. "Get off, Get Out" is the weakest song, but the mild Porcupine Tree vibe and the guitar arpeggios are enjoyable. "Universal" is more progressive: it starts out as a slow, vocal-centered piece, but the second half is instrumental. There's a great solo by Danny and some sweet orchestrations in this song. "Hindsight" shifts between major and minor keys and brings the album to a close successfully. We're Here Because We're Here is by far the most cohesive and complete Anathema album since Judgement (1999). Years of hard work paid off, and the resulting record is lively and diverse. It's not an absolute 10 like Alternative 4 (1998) and Judgement, but Anathema found its own identity and signature sound on this euphoric rebirth of an album, and it set the standards for the subsequent records. Unengaged, dim lit love didn't taste the same"
After A Natural Disaster (2003), Anathema found itself without a record deal when Music for Nations was shut down. The band couldn't seem to find a new label or management, and several obstacles slowed them down. However, Anathema continued to play live and write new music, and amidst all that they managed to fulfil their long-time dream of releasing an acoustic album. Hindsight consists of (semi)acoustic versions of songs from the 1996-2003 period, along with a previously unreleased song, "Unchained (Tales of the Unexpected)". Besides acoustic band instruments, the album includes cello by guest musician David Wesling and mandolin by ex-member Duncan Patterson. Danny Cavanagh also plays leads with an Ebow, which makes his wailing guitar sound even more distinct. Opening track "Fragile Dreams" starts out driven by piano and cello, but reaches a powerful climax at the end when the full band joins in. The song manages to sound intense even at a slower tempo and with minimalistic instrumentation. "One Last Goodbye" features a highly emotional vocal performance by Vincent Cavanagh, who sounds like he's on the verge of tears. "Are You There?" benefits the most from the acoustic treatment: the folky fingerpicking is lovely and makes the song stick out, unlike the original, fairly generic arrangement. Another highlight is "Angelica", which sounded too heavy and unrefined on Eternity (1996), but works brilliantly as an acoustic song. Unfortunately the rest of the tracks don't measure up, as most of them had already been understated and mellow in their original forms, and the arrangements haven't been changed that much. "Inner Silence" loses its emotional impact due to the repetitive ending, and "Unchained" is a rather underwhelming song, although I get that the band wanted to save the best of the new material for its next full-length album. Even though Hindsight isn't an essential release by any means, it's not a complete waste of money, as the versions of "Are You There?" and "Angelica" are so good that I never listen to the originals anymore. Hindsight also works as the closure of a chapter in the band's career, before they moved on to the sound they're known for these days. Times have changed and now I find I'm free for the first time"
Danny Cavanagh went through a rough period in his life in 2002 and even left Anathema for a brief time. This is reflected in the dark and minimalistic approach of A Natural Disaster, which includes plenty of experimentation. The electronically-tinged opener "Harmonium" makes it clear that this album is a different beast than any previous Anathema release. The prominent guitars and the agonized scream at the end of the song, however, make it very heavy in a way. "Balance" is a pleasantly melodic track, bringing back the Radiohead influence of the previous album. However, the Vocoder-driven and repetitive sound of "Closer" is a far cry from the accessible rock of A Fine Day to Exit (2001). This song is at its best when played live: the hypnotic, even danceable, rhythm makes you want to jump up and down! "Are You There?" is a decent song, but I feel the acoustic arrangement on Hindsight is a better version of it. "Childhood Dream" is a sweet little interlude, which is ironically followed by the most aggressive song on the album, "Pulled Under at 2000 Metres a Second". The strong bassline and Vincent Cavanagh's strong vocal delivery make this a memorable song, even though it's radically different from the rest of the album, and a few band members have gone on record saying they don't like it. The Portishead-influenced title-track highlights Lee Douglas' beautiful voice, and its trip hop vibe is unique for Anathema, making it a classic. "Flying" is another hit: very simplistic, yet beautiful, and the reversed guitars add interesting soundscapes. Unfortunately the last two songs are clearly the weakest: "Electricity" is a forgettable semi-acoustic tune, whereas the 10-minute instrumental "Violence" is way too drawn-out. I have mixed feelings on A Natural Disaster: most of the songs are good, but the chaotic nature of the album prevents it from being one of the band's best. Anathema has always made diverse albums, but I feel AND lacks the cohesion of the other releases. 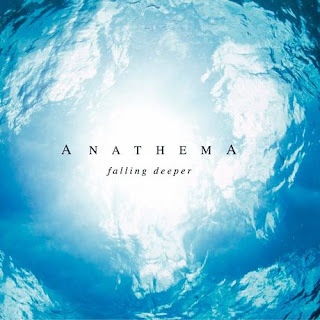 Although none of the songs can compete with the absolute crown jewels of the Anathema discography, there's plenty of good material to go back to, such as the title-track, "Flying" and the combo of "Balance" and "Closer". 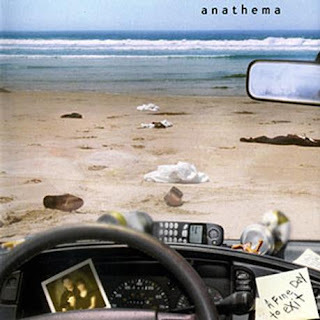 The moment is passing you by"
Anathema took a step in the direction of alternative rock, close to the territory of Radiohead, with 2001's A Fine Day to Exit. The album is guitar-driven like Judgement (1999), but the sound is more modern and less atmospheric. 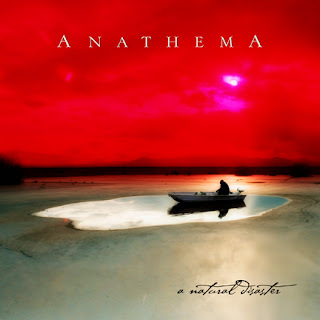 The songs are more mainstream, but not in a negative way - in fact, this is arguably Anathema's most accessible album. The Beatles-influenced "Pressure" feels like a weird opening track (we'll get to this later) with its minimalistic chord progression, but it has a catchy chorus, so it's a shame it never became a hit, despite the record label's attempts. "Release" is a great track with cool synth bass, rocking guitars, and brilliant vocal harmonies. "Looking Outside Inside" is good as well, even though the beautiful first half and the loud ending feel kind of disconnected from each other. The synth sounds give "Underworld" a cool vibe, and it's another song that should've been a rock radio hit. "Barriers" is a well-needed respite, but I've never thought Danny Cavanagh's voice was on the same level as his brother Vincent's, so his debut as a lead singer doesn't convince me. If the songs until now have been atypically rocking and modern for Anathema, "Panic" takes this change to its extreme: it's a punky up-tempo track with crazy lyrics, but surprisingly enough the song works and is actually one of the album's highlights. A Fine Day to Exit ends with what are arguably the two most traditional Anathema songs on the album. The title-track is the peak for me and one of my all-time favorite Anathema tunes - it's got a little bit of the dark Alternative 4 (1998) vibe that I love. "Temporary Peace" is a great closer that sounds melancholy yet gives a little bit of hope: "with you I start to feel a sort of temporary peace." Drummer John Douglas' ramblings about dogs, cats and chickens and the hidden track "In the Dog's House" at the end of the album show that Anathema has a sense of humor and are a nice comic relief. A reissue with a previously unreleased intro and a rearranged tracklist came out earlier this year. I own this version, as I bought the Fine Days box set this summer. While I think the one-two punch of the intro and "Release" is the best way to open the album, I don't like the way some of the songs that used to be linked with direct segues on the original release have been divided. However, nobody is forced to buy the new version, so the fact that the band finally found peace of mind by using their artistic freedom is what matters the most. A Fine Day to Exit is a fine album that shows a different side of Anathema. This may also be why the album is slightly divisive among the fans, as not everyone is pleased with its modern rock sound. I have to admit I prefer the band's atmospheric side, but thanks to the fairly solid songwriting and classics like the title cut, "Release" and "Panic", AFDTE has earned a place in my big 4 of Anathema albums.